Allard Mailer #5 is the best mailer of the campaign. This here is the best sign of the campaign. You could tell by how fast they were getting ripped down after being posted. This latest mailer from the Allard campaign went back and keyed on all the reasons why you should support John Allard. Gaines’ mailers went from a 6 1/2×11 postcard to a full-size postcard to a four-page attack against John Allard (with no mention of why to vote for Beth) to another positive postcard piece about immigration only, then peice five was the bizarre letter in the envelope. Allard’s 5th Peice features: Lew Uhler, the CRA (YEAH!) and venerable retired State Senator Tim Leslie. ON the front is a cut out of him signing the no new taxes pledge along with the bullet points about his qualifications – something Beth Gaines could not match. I’d assume this went to the master voter list that you can purchase from the Registrar’s Office. If you’re tired of being jobless or the threat of loosing your property rights, then Support Rob Matthews. If you’re tired of businesses fleeing the State and taking there jobs with them, then Vote for Rob Matthews. Vote Rob Matthews for Assembly! He’ll get the job done! Please support your cause by donating $2.00 – $5.00 dollars to our campaign. We appreciate your support and will accomplish much with our Grass Roots efforts. Help me build a better future for our State. AD-04 Update: Disturbing News out of Speaker Perez’ Office – AD04 a Target for Dem Takeover? With a left-wing liberal Democrat like Jack Duran winning a supervisor seat in Roseville and the Richard Pan race giving the Dems a foothold in Granite Bay – the socialists that run the capitol are drooling. The Democrats think they can further pierce Dark Red Placer County. 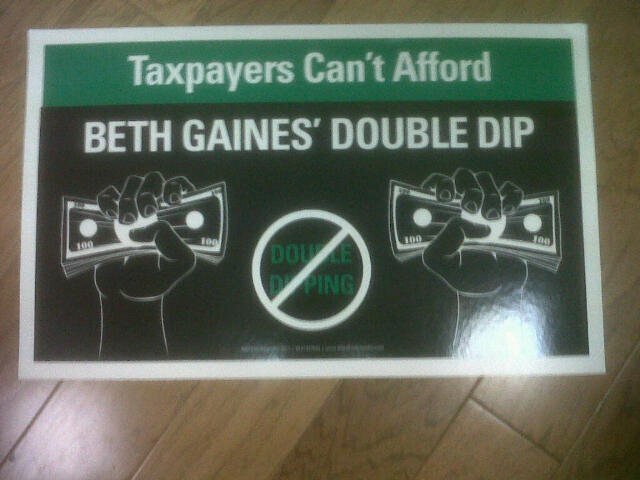 It is the perceived weakness of Beth Gaines that has them salavating. As it was told to me by a source inside speaker Perez’ office – Beth has had tremendous difficulty raising money from donors historically alinged with Ted Gaines. As the residency issue alomst cost Conservative Icon Tom McClintock in his 2008 Congressional race, the Nepotism issue seems to be a larger factor against Beth Gaines than anyone thought. Finally, the Dems are all aware of the cue cards etc and the reticence of the Gaines camp to have Beth Gaines in open format debates or exposed to having to speak at length in public (without questions in advance / controlling the format, etc). The perception is that the combination of the above as an opportunity. … what this means is – Perez still has an estimated $6million to play with. He could easily unload enough of it to prop up Campanelle. They got a terrible candidate Richard Pan (who can’t finish a sentence) elected, why not a 60+-year-old Union Organizer? As of the date of this posting – Gaines still only has two Placer County Endorsements. Please also note that Vern Pierson – the DA of ElDorado County was a feature in some vicious attack ads against Tom McClintock in the 2008 Primary. Ron Briggs was previously featured on the website but disappeared and John Knight appeared than mysteriously disappeared – and now we know why. PLACERVILLE, CA — El Dorado County District Attorney Vern Pierson, Supervisor Ron Briggs and Supervisor John Knight have endorsed Republican Beth Gaines for Assembly, joining Supervisor Ray Nutting and other key El Dorado leaders who have previously endorsed Gaines. “Beth Gaines is El Dorado County’s choice for State Assembly,” said District Attorney Pierson. Gaines said that the state budget crisis is impacting counties and that she will work for a solution that does not involve raising taxes on already strapped small businesses and families. The significance? These are all endorsements that Ted Gaines has had in the past. This is why they had to call John Allard “Mr. Government” as their campaign gets more isolated. Please also note that the third ElDorado Supervisor endorsement has disappeared off of the Beth Gaines website. Not sure why. Roseville – Small businessman and Assembly candidate John Allard has been endorsed by the CDF Firefighters. Allard is running in the 4th Assembly District. The CDF Firefighters represent more than 6,500 men and women within CAL FIRE. A full service fire department with over 145 contracts in 35 different cities, they are “California’s Fire Department.” CDF’s endorsement comes on the heels of the Police Officers Research Association of California’s (PORAC) endorsement. Allard’s long list of supporters includes the California Republican Assembly, National Tax Limitation Committee President Lew Uhler, the Roseville and Sacramento Police Officers Associations and the Young Republicans Federation of California Sacramento Chapter.